States should ban all driver use of cell phones and other portable electronic devices, except in emergencies, the National Transportation Board said Tuesday. WASHINGTON (AP) — Texting, emailing or chatting on a cellphone while driving is simply too dangerous to be allowed, federal safety investigators declared Tuesday, urging all states to impose total bans except for emergencies. Inspired by recent deadly crashes — including one in which a teenager sent or received 11 text messages in 11 minutes before an accident — the recommendation would apply even to hands-free devices, a much stricter rule than any current state law. A group representing state highway safety offices called the recommendation "a game-changer." "States aren't ready to support a total ban yet, but this may start the discussion," Jonathan Adkins, a spokesman for the Governors Highway Safety Association, said. NTSB chairman Deborah Hersman acknowledged the recommendation would be unpopular with many people and that complying would involve changing what has become ingrained behavior for many Americans. While the NTSB doesn't have the power to impose restrictions, its recommendations carry significant weight with federal regulators and congressional and state lawmakers. 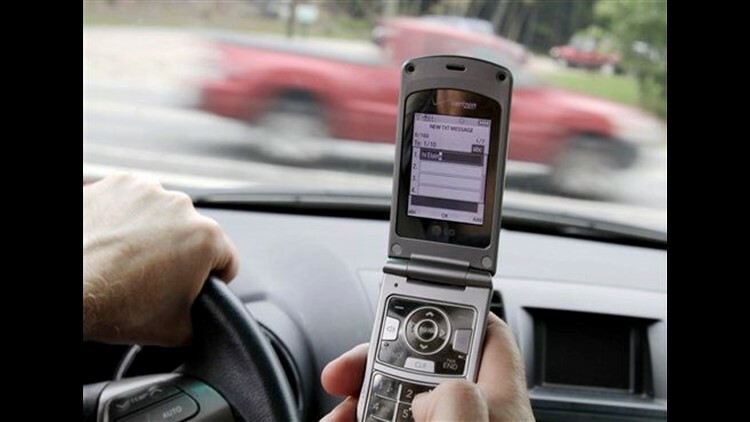 Another recommendation issued Tuesday urges states to aggressively enforce current bans on text messaging and the use of cellphones and other portable electronic devices while driving. "We're not here to win a popularity contest," she said. "No email, no text, no update, no call is worth a human life." Currently, 35 states and the District of Columbia ban texting while driving, while nine states and D.C. bar hand-held cellphone use. Thirty states ban all cellphone use for beginning drivers. But enforcement is generally not a high priority, and no states ban the use of hands-free devices for all drivers. A total cellphone ban would be the hardest to accept for many people. Leila Noelliste, 26, a Chicago blogger and business owner, said being able to talk on the cellphone "when I'm running around town" is important to self-employed people like herself. "I don't think they should ban cellphones because I don't think you're really distracted when you're talking, it's when you're texting," she said. When you're driving and talking, "your eyes are still on the road." The immediate impetus for the recommendation of state bans was a deadly highway pileup near Gray Summit, Mo., last year in which a 19-year-old pickup driver sent and received 11 texts in 11 minutes just before the accident. NTSB investigators said they are seeing increasing texting, cellphone calls and other distracting behavior by drivers in accidents involving all kinds of transportation. It has become routine to immediately request the preservation of cellphone and texting records when an investigation is begun. In the past few years the board has investigated a train collision in which the engineer was texting that killed 25 people in Chatsworth, Calif.; a fatal accident on the Delaware River near Philadelphia in which a tugboat pilot was talking on his cellphone and using a laptop computer, and a Northwest Airlines flight that sped more than 100 miles past its destination because both pilots were working on their laptops. Before and after each enforcement wave, NHTSA researchers observed cellphone use by drivers and conducted surveys at drivers' license offices in the two cities. They found that in Syracuse, hand-held cellphone use and texting declined by a third. In Hartford, there was a 57 percent drop in hand-held phone use, and texting behind the wheel dropped by nearly three-quarters. The board's decision to include hands-free cellphone use in its recommendation is likely to prove especially controversial. No states currently ban hand-free use although many studies show that it is often as unsafe as hand-held phone use because drivers' minds are on their conversations rather than what's happening on the road. The board has previously recommended bans on texting and cellphone use by commercial truck and bus drivers and beginning drivers, but it had stopped short of calling for a ban on the use of the devices by adults behind the wheel of passenger cars. About two out of 10 American drivers overall — and half of drivers between 21 and 24 — say they've thumbed messages or emailed from the driver's seat, according to a survey of more than 6,000 drivers by the National Highway Traffic Safety Administration. However, the survey found that many drivers don't think it's dangerous when they do it — only when others do. At any given moment last year on America's streets and highways, nearly one in every 100 car drivers was texting, emailing, surfing the Web or otherwise using a hand-held electronic device, the safety administration said. Those activities were up 50 percent over the previous year. Driver distraction wasn't the only significant safety problem uncovered by NTSB's investigation of the Missouri accident. Investigators said they believe the pickup driver was suffering from fatigue that may have eroded his judgment. He had an average of about five and a half hours of sleep a night in the days leading up to the accident and had had fewer than five hours of sleep the night before the accident, they said. Investigators also found significant problems with the brakes of both school buses involved in the accident. A third school bus sent to a hospital after the accident to pick up students crashed in the hospital parking lot when that bus' brakes failed. However, the brake problems didn't cause or contribute to the severity of the accident, investigators said. Another issue involved the difficulty passengers had getting out of the first school bus after the accident. Its doors were unusable and passengers had to exit through an emergency window. The raised latch on the window kept catching on clothing as students tried to escape, investigators said. Escape was further slowed because the window design required one person to hold the window up in order for a second person to crawl through, they said. "It could have been a much worse situation if there was a fire," Donald Karol, the NTSB's highway safety director, said.